Are you heading to Node.js Interactive? It’s the premier event for those who use Node.js, whether you are a developer, a vendor, or representing a company. In addition to providing great dialogue and networking around Node.js, the event also provides a great opportunity for attendees: the chance to help support local children by donating books to Tux’s Bookworms! 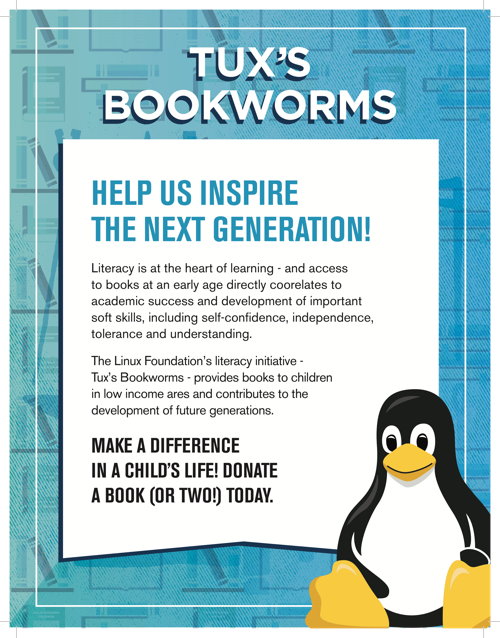 According to the Tux’s Bookworms site, the initiative is “a project aimed at increasing literacy by providing more options for young readers an initiative to provide books to children in low-income areas and contribute to the development of future generations.” It does so by donating books to children located in the host city of the conference. The initiative’s overall goal is to get 20,000 children’s books to share. All books collected at Node Interactive will be donated to Vancouver’s “Books For Me!” literacy foundation. If you want to support this great cause, it’s easy: simply bring a children’s book or two to donate! Feel free to include books in Spanish and books for readers between 0 – 8, and leave the textbooks, encyclopedias and adult books at home (Tux’s Bookworms cannot accept those). There will be a donation station near registration at Node Interactive, and you can drop your books off there - and even personalize them a message if you want. If you would prefer to purchase your books at Vancouver rather than travelling with them, you can find out where to get them - and get more information about this initiative - at the Tux’s Bookworms site. Keep an eye out for a future post telling you how IBM and StrongLoop will be involved with Node Interactive (spoiler alert: we are one of the Platinum Sponsors and will be speaking there). In the meantime, find out what other conferences, webinars, meetups, and events that the StrongLoop team are attending or supporting on our events page.